He popped the question! 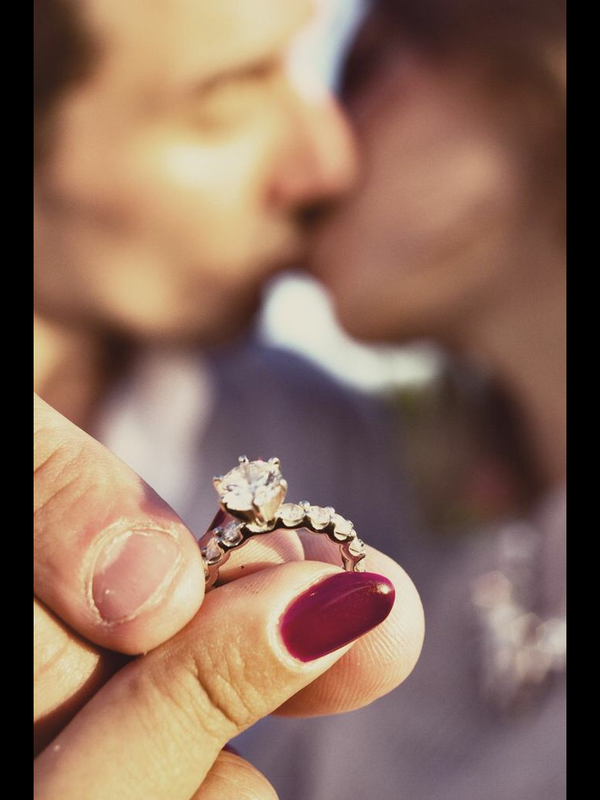 You shared the pix on Instagram and Facebook, you can’t stop staring at your new diamond ring – it’s so sparkly and hits the light just right! But wait, it’s not as shiny as it was when you first got it – how can you get that shine back? Here are some quick tips to keep your ring in tip-top shape! 1) Buy a ring solution (try this one from Amazon) and soak your ring in the solution from anywhere from 10 minutes to overnight if it’s really dirty. Then use a toothbrush to gently clean off the grime. Voila! Sparkly and new! 2) Don’t wear your ring when washing dishes, showering, or putting on lotion. This sounds like a no brainer, but sometimes you just don’t get a chance to take off your ring when doing the dishes. I recommend keeping a ring holder in the bathroom and by the sink so you can safely set it down while showering or washing dishes. Soap and lotion makes the ring go dull super fast. 3) Avoid wearing your ring to the gym. You just don’t want to bang it up on weights, and the sweat and oil will also contribute to it losing it’s shine. I know – it’s difficult to take it off, but it’ll protect your ring in the long run! 4) Every now and then, take your ring to the jeweler to get professionally cleaned or polished. Especially do this right before your wedding! You don’t want the ring photos to showcase a dull stone! 5) Finally, I found this little video on Fabsugar on how to use household solutions to clean your ring. Like literally- you can use a baking soda paste to clean your ring! Any other thoughts on ring care? Feel free to sound off in the comments. I feel like everyone I know is getting engaged – my Facebook feed is filled with sparkly rings and smiling couples. I couldn’t be happier for those who plan to spend their lives together. Yay for wedding planning! Having just gotten married a little over two years ago, here’s some “practical” advice for newly engaged couples! 2) Insure your ring. Let’s hope your jeweler provided you with an appraisal, because you should get insurance on your ring. And then, you should also buy ring cleaning solution. No joke! I don’t think I realized how dirty a diamond ring can get so quickly, but talk to your jeweler to get their thoughts on ring cleaning. A solution is super cheap and will keep your ring sparkly! 3) Weddings are expensive (The Knot reports the average cost is around $28,000 – I bet it’s much more for multi-day Indian/Pakistani weddings). It’s a little mind boggling how expensive some vendors are, so you should sit down and figure out what kind of a budget you and your fiance have – and whether the parents are willing to pitch in, and how much. Be realistic, the first photographer I emailed started at $8k – there was just no way that was in my budget. Furthermore, I know for some Pakistani families (mine included), the tradition is that the groom’s family is responsible for the cost of the bride’s trousseau, so those items should also be discussed (granted, I married non-Pakistani, so there was no discussion here!). 5) Finally, start browsing blogs and wedding magazines to get inspired, and then pin them to above said board. There are so many blogs I found inspiration from (but unfortunately so few that focused on South Asian or more specifically – Pakistani wedding planning!) – a few of my favorites: Style Me Pretty, Green Wedding Shoes, etc. Find out what you like and what you don’t like by browsing these. Also be prepared to be slightly depressed – some of the blogs only feature “the top of the line” vendors- which is fair, but note that those vendors come with sky high prices. Did I miss anything? What do you think is essential in starting to plan your wedding? Sound off in the comments!